I now know what I am. This question in my mind has been bothering me for some considerable time now. Happily, today I have found the answer. I am an alien life form that is living on a very strange planet. I suspected this was the case a few years back when the territory I was living in – called the United Kingdom seemed to have an established elite that regarded the idea of a pluralist democratic independent sovereign state is an anathema and to be solely on the wish list of political extremists. Then there was “climate change”. This was the unsubstantiated theory, that was proclaimed as undisputed and settled fact, that human emissions of the gaseous compound CO2 – of which this planet’s atmosphere contains trace elements – was responsible for unprecedented warming of the planet that if left unchecked would render the planet uninhabitable in all places except the land mass at its south polar region! Extraordinary! Today however my suspicions have been confirmed. I am clearly an alien life form. What event precipitated this revelation? You ask…. Shoe laces. Or more precisely trainer laces – those lengths of braided cord that are used by humans to secure the attachment of footwear to their feet. I had occasion to visit a convenience store to purchase some items of food. 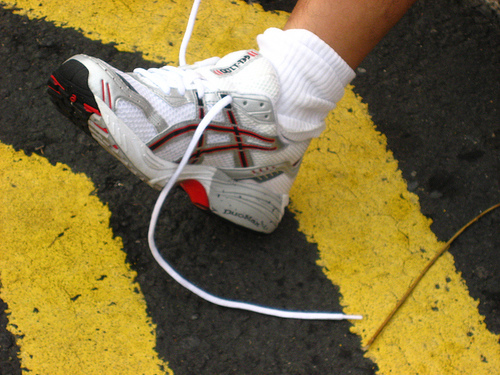 Whilst queuing at the checkout I noticed that the youth in front of me had on his feet a pair of trainers that had the laces – that were very long – completely unfastened and trailing. As this young human male moved forward in the queue, it was clear that he was treading on the laces and if left unfastened could lead to a situation where he could trip himself up. I therefore tapped him on the shoulder to get his attention so I could inform him of the potential danger. “Your laces are undone. You are likely to trip yourself up.” I replied restating the warning. To which the creature replied. That settles it. I am an alien and this is not my home planet.